This is one of those books where I was disappointed by the end of chapter one. It's a framing chapter, setting up the murder around which the rest of the book will revolve and introducing the main suspect. The suspect is interesting and the potential pathos is high but it was told from a distance, never really letting me inside the suspects head. It read more like the notes I might give an actor who wants to play this part. The text was a little heavy-handed, leaving me in no doubt about what I was supposed to feel but not actually making me feel it. It wasn't a long chapter, so I moved on to the next, already wondering if this book would be another for my DNF pile and asking myself if I was becoming too picky or maybe I was just jaded. Then I met Sydney Rose Parnel and I wanted to ask the author and the editor: "Why didn't you start here?". Sydney is compelling. She's an ex-soldier who spent fourteen months in Mortuary Affairs in the US Army, scooping up human remains in Iraq. Now she's a railroad cop back in her home city, Denver. I don't know much about her yet but I already know that I want to know a lot more. Now the writing is deft, letting the reader discover and guess rather than signposting meanings. We see her and her ex-army service dog out amongst the homeless she's supposed to roust but who she also feeds. Then we see her at the crime scene. Her approach is credible, pain-filled, more than a little off-centre in a PTSD kind of way and completely human. So now I want to read this and i'm hoping I've found another series. So why not start here? I can see the temptation for the writer to start at the beginning. The writer needs to imagine that beginning in detail in order to write the rest. They probably needed to write this chapter. I would hope that an editor would ask the question: does the reader need to start here? Anyway, it's an example of where judging a book from its first chapter is about as much use as judging it from the publisher's summary. "Strange Sight" is a slightly disappointing sequel. 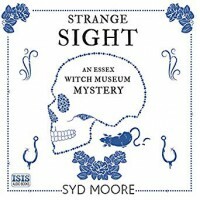 "Strange Sight" follows on immediately after "Strange Magic" which introduced us to Rosie Strange just as she inherited a museum to Essex witches. This time, Rosie is investigating a rather spectacular haunting of a posh restaurant in the City which seems to have resulted in a brutal killing. For me, this book didn't live up to the promise of the first book. It was a light cosy read with a dash of Carrie-style supernatural (albeit reported rather than seen) but it was slow to start with nothing much happening in the first quarter of the book. The main problem I had with it is that Rosie Strange seems to have lost her edge and is sometimes barely recognisable as the proudly independent, sceptical woman from Essex who made her living tracking down Benefits Fraudsters and tending not to believe in anything that needed a supernatural explanation. In this book, she often obsesses about how things look. She is constantly stealing lusty glances at her we're-just-friends partner, or dissecting the makeup and clothes of other women or contemplating her own sartorial skill. I'm sure this is meant to be amusing but it felt like something shoved into the narrative from time to time for appearance's sake. The second half of the book is much stronger. There's a real plot, with plausible sub-plots, lots of action, some comedy, some drama, some sociopolitical commentary and some great dialogue. There's also a promising set up for the future story arc as Rosie discovers more about her families past and her own links to Essex witches. On the whole, I'm glad I read this but it hasn't left me hungry for more. I'll take a break from Rosie for a while and hope that the next book is stronger and that Rosie stops pressing her bimbo button. The narration was well done, click on the SoundCloud link below to hear an excerpt. Reading progress update: I've read 18%. - WOW - why has this been on my shelf unread for more than a year? I haven't slid into a book like this in ages. It's grabbed me the same way "Hunger Games", "Divergent" and "The Scorpion Rules" did. When YA SF is done well, it enables an intense focus that is seldom equalled elsewhere. 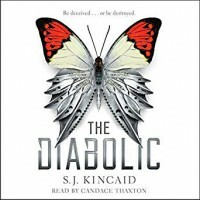 "The Diabolic" is set in a ruthless far-distant future, with a galactic empire ruled by a new technology denying elite that nevertheless owes its power to the total control of existing technology that their society depends on. We see this world through the eyes of a Diabolic, a creature bred to be capable of great violence and great loyalty to a single person. The plot moves at a good pace. The main character is engaging and the environment is soaked in threat. I've just finished the part where our hero gets to see things from the family's point of view, as explained by Sophia. I do wonder whether, after letting that point of view sink in for a while, our hero will still be quite so keen to marry in to this family. They remind me of one of the collective nouns for cats: "a pounce of cats". You'd have to establish very early on that you were not prey. Young Josephine is a fascinating creation. A little chilling, quite believable and impossible to look away from. If Agatha Christie had seen a market for Young Adult books, I imagine Josephine might have become the role model of many young girls who wanted more agency over their lives. Of course, I have no idea who the murderer is, but I am getting a thorough education in the ways in which those who have always been wealthy exercise an instinctive ruthlessness that allows them to stay that way and to continue to feel completely entitled to do so. "Dogs Of War" is an engaging, original, intriguing and accessible Science Fiction. "My name is Rex. I am a good dog."? Ok, Rex is a partly dog-based bioform, engineered to carry out the kinds of acts of war that humans, even most bad humans, would flinch at, but that's not his fault. He was made that way. The question is, will he stay that way? 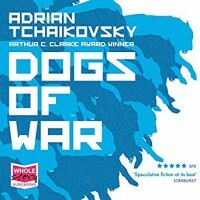 "Dogs Of War" was my first Adrian Tchaikovsky book. I knew he'd won the Arthur C Clarke Award for his "Children Of Time", which is in my mountainous TBR pile. Even so, I was surprised at just how good he is. In this book, he delivers speculative fiction at its best. He handles complex ideas in interesting ways that are plausible without being predictable. He creates characters that I care about and who ground the big ideas in the personal and the immediate. He has a plot that unfolds in a way that is both seamless and exciting. And, of course, he has a character that's at least half dog right at the centre of the action. One of the big ideas being explored here is the evolution of intelligence. In one, action-packed novel, Tchaikovsky manages to tackle the emergence of an AI singularity, the impact of implants and bio-engineered enhancements on humans, dogs, bears, bees, lizards and dolphins. He deals with hive-minds, genius minds, immortal minds, evil minds and implant-enforced compulsion. Through the lens offered by these differently intelligent characters, he explores the use of violence as an extension of politics, the need/ability to make moral choices rather than follow orders and the willingness of the powerful to strip personhood from anyone or anything when it suits their purpose. What I liked most about the book is that it is centred on Rex's journey from being used as a weapon by a war criminal who controls him via implants that reinforce his need to be a Good Dog to being a leader who has to decide whether or not he is a Good Dog. I particularly liked that Rex never becomes just a human in a dog suit or an anthropomorphized Old Yeller. He is a bioform who grows to understand his abilities, limitations and needs and tries to behave honourably. He builds friendships with Honey the genius and monstrous bear, he leads a pack, he defends those he believes should be defended and he struggles constantly not to give in to his desire for a Master. I'm now an Adrian Tchaikovsky fan. Thankfully, he's quite prolific. I'll be reaching for his "Children Of Time" novel next. I've been surprised by how fresh and simple the humour in this book is. The writing feels relaxed and confident as if Agatha Christie is enjoying the people she's writing about rather than working to set up a plot. What a wonderfully English-in-the-forties way to propose. I can't figure out whether he's finally spotted something that would nicely accessorise his post-war life or if there is genuine passion there. There's so much repression of emotion that I wonder if either of them is clearer on the answer than I am. His inclusion in the investigation is such an "establishment" thing (although that phrase had yet to be coined) he's included because he's the right sort, connected to the right people. I'm interested in the way Christie treats the Greek origins of the family. She's often come across as anti-foreigner, firmly wedded to a belief in English exceptionalism, yet here she has a self-made man marrying in to a "decent" family. Of course, there are digs at his faux-English Cottage style of architecture and it's simply accepted that, while not actually criminal, he exploits every loophole to his advantage. Yet none of this seems to be intended to be negative. The overall impression is of a charismatic, driven man who has made his mark. Perhaps that will unravel as we understand the dynamics of the family this man created and wrapped around him in his crooked house. 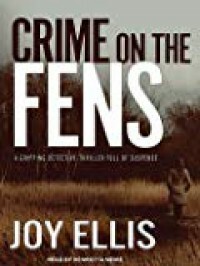 "Crime On The Fens" is an original story with some strong characters marred by boiler-plate text. 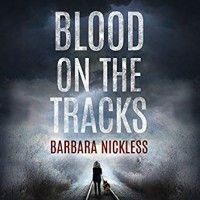 The was lots to like about "Crime On The Fens": the police officers were a diverse and believable set of people, the story moves quickly, the plot is full of twists and turns, the dialogue is good and Joy Ellis knows how tug at my emotions and make care about what happens to the people in the story. I can see that this would make good television. Sadly it doesn't make such a great read because the prose that moves the action along is distractingly bland. Where was Joy Ellis' editor? How could s/he let so much boiler-plate, cliché-ridden text through just to keep the story moving? Do we need to know that one of the policemen has steely-grey hair? Or that another "slips like a shadow across a wall" or have a description of a major character's interior dialogue that reads like stage directions? I can see how all of these things might be there in a first draft as the writer fully imagines the action. That they made it to the final draft is disappointing. It also doesn't help that the narrator of the audiobook can clearly see the pieces of flat prose and tries either to speed through them or gives them an inflexion-free delivery. I also disliked the decision to change the title. The book was originally called "Mask Wars" which has a ring to it and is relevant to the story. "Crime On The Fens" has that it-will-help-the-punters-see-it-as-part-of-a-series-in-the-Fens thinking behind it that is a little patronising and which sounds bland and boring. This might work better as an ebook, where I could just skip over the purely functional text and move on to the good bits. The narrator also seemed not quite to have the range to deliver this novel. The accents where all over the place and the pacing was sometimes off. I won't be following up with this series but I will give Joy Ellis' later series a try to see if the writing/editing has improved. Reading progress update: I've read 28%. So far, this isn't living up to the promise of the first book. It's a light cosy read with a dash of Carrie-style supernatural (albeit reported rather than seen) but the pace is slow and somehow Ms Strange isn't gelling with me this time. She seems to have lost some of her edge. I'm hoping things will improve in the face of imminent danger (assuming there is imminent danger - so far the most dangerous thing seems to be cultivating balcony plant in Walthamstow). This means I have two Meh! books on the go at the moment. 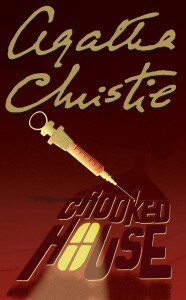 I'm looking forward to starting "Crooked House" tomorrow. Only just started but part of me is already sighing.So far this seems quite dreary. Maybe dreary is what the author is aiming for but I can live without thirteen hours of dreary. I'll give it another hour and then decide if it's for me. "Circle Of The Moon" is the fourth Nell Ingram book, set in the same world as the Jane Yellowrock series. If you haven't read any of the others, don't start here, go back and enjoy the whole series. For me, this book got off to a slightly clunky start as we caught up with events since the violent and traumatic end to the last book, "Flame In The Dark". I liked the idea that Nell and Occam were both still recovering rather than being magically all better but I could have done with less "Previously, on Soulwood" and just getting on with the story. My favourite parts of this story dealt with Nell's relationship with her sister, Mud and her visits back to her family in the Cloud Of God compound. Mud is irrepressible and the dialogue between her and Nell sparkles. I liked that Nell is getting stronger and more confident of her place in Unit 18. She's no longer the Probationer and no longer the Widow woman / Churchwoman figuring out a new and strange world. Her confrontation with her boss's boss, Firewind, was well done and shows that Nell is being to understand her own worth and her own strength. I also enjoyed the way that Nell dealt with the main vampires in the book. She stands up to Ming of Glass without overstepping into an attack and she treats Yummy fairly and offers her something as close to friendship as she can manage with a vampire. It was refreshing to get such a different perspective on vampires than the Yellowrock vamp-killer turned insider view. It seems to me that Nell is becoming a little less human with each book. Or perhaps she's just getting to know herself better. WHAT she is becoming is hard to say. Faith Hunter has come up with an original set of powers for Nell. I'm curious to see what Nell will do with them. 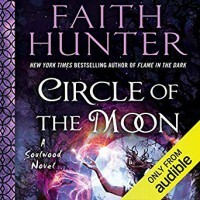 Yet again, Faith Hunter has provided an above average urban fantasy story that was a fun read. She's developing the characters and opening up the possibilities of the series. The plot was a little straight forward in a save-the-world-from-the-demon-summoner kind of way but the powers used were unusual and the action was well described. The heart of the story lies with the characters. If you like Nell and her sister, you'll enjoy this book. 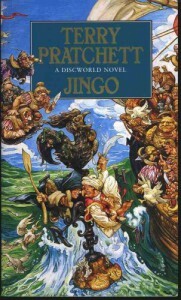 I'm re-reading Terry Pratchett's "Jingo". I know he's dead and, even if he wasn't, he wrote this book in 1997, when I was twenty and if you'd told me about Brexit I'd have admired your creative imagination... after I stopped laughing, but he seems to have read my mind... in advance. You see, I've been telling myself that Brexit was a conspiracy by THEM, the people I've always hated but who have somehow managed to take something I value away from me. True, 17.4 million people voted for Brexit but that was because THEY conned them. That has to be true because otherwise 17.4 million of my countrymen voted for Brexit with the enthusiasm of lemmings entering a cliff-diving contest because of xenophobia, dreams of empire or because they believed what was written on the side of a bus by an organisation with no other purpose than to say whatever it took to win. So how did Terry Pratchett know I'd be thinking this? Either he was psychic (and I'm much more important in the universe than seems possible) or he had an insight into how people's minds work that must have been so deeply depressing that he'd want to spend as much time as he could escaping into a fantasy world; except, when he got there, he'd dragged the insight along with him because wherever you go, there you are. "And then he realised why he was thinking like this. It was because he wanted there to be conspirators. It was much better to imagine men in some smoky room somewhere, made mad and cynical by privilege and power, plotting over the brandy. You had to cling to that sort of image, because if you didn't then you might have to face the fact that bad things happened because ordinary people, the kind who brushed the dog and told their children bedtime stories, were capable of going out and doing horrible things to other ordinary people. It was much easier to blame it on Them. It was bleakly depressing to think that They were Us. If it was Them, then nothing was anyone's fault. If it was Us, what did that make Me? After all, I'm one of Us. I must be. I've certainly never thought of myself as one of Them. No-one ever thinks of themselves as one of Them. We're always one of Us. It's Them that do the bad things." This is my first Joy Ellis book. I have a few more in my TBR pile. I'm enjoying the storyline - it's fresh and I can't see where it's going and it's avoiding being exploitative. I quite like the two detectives, each with their "secret" pasts that they share with each other before the book is halfway through. But where was Joy Ellis' editor? How could s/he let so much boiler-plate, cliché-ridden text through just to keep the story moving? Do we need to know that one of the policemen has steely-grey hair? Or that another "slips like a shadow across a wall" or have a description of a major character's interior dialogue that reads like stage directions? I can see how all of these things might be there in a first draft as the writer fully imagines the action. That they made it to the final draft is disappointing. I'm hoping the next books are better. It also doesn't help that the narrator of the audiobook can clearly see the pieces of flat prose and tries either to speed through them or give them an inflection-free delivery. If you've read Joy Ellis, let me know, does it get better? This is a beautiful dissection of the madness of Jingoism which, these days has mutated into (INSERT NAME OF COUNTRY HERE) Exceptionalism. Carrot was good at picking up this sort of thing. And I know how to ask for Vindaloo, he thought. And it turns out that's just a Klatchian word meaning: 'mouth-scalding gristle for macho foreign idiots'. I also love how confidently and how frequently Pratchett starts his sentences with AND. 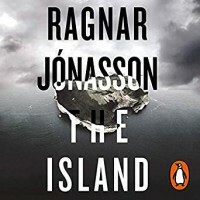 “The Island – Hidden Iceland #2” by Ragnar Jonasson -highly recommend (but read The Darkness first). "The Island" was a deeply satisfying read. The writing is sparse but confident, delivering movement between multiple points of view and backwards and forwards across multiple timelines so seamlessly that there is never any confusion, only a growing sense of tension as the plot is revealed. The way in which the plot is revealed is innovative without being gimmicky. Ragnor Jonasson offers the reader different views of a complex pattern that we know will come together like a beautiful piece of lace and invites us to guess the design as he turns a piece of it in front of us. He presents a person and a set of events, bringing them into vivid focus, and then moves on, repeating the process but with people and situations that don't immediately seem to be linked to the last point of focus. A lot of the fun comes from holding these points in your mind and trying to connect them before Jonasson does it for you. "The Island" is more than a clever plot. It is the story of people whose lives are ruined by an act of violence. I liked the fact that it was not the act but its consequences that Jonasson focused on. He shows us people in pain because of guilt, shame, and grief. He makes that pain real, not to celebrate the pain but to build empathy with the people suffering. This is less a whodunnit and more a look-what-happens-when-this-is-done. It is a sad book, filled with small acts of deception or greed or aggression that damage the happiness both of the person committing them and the person they are committed against. It's a bok where the quiet struggle with despair is always present. "The Island" is the second book in the "Hiden Iceland" series, which started with "The Darkness". The main character in both books is Reykjavík police detective Hulda Hermannsdóttir. In "The Darkness" Hulda was sixty-four and approaching retirement. At the start of the events in "The Island", she is forty. 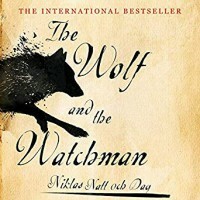 I was curious to see how this technique of revealing Hulda's life backwards would work, Jonasson makes it into more than a marketing trick. He uses is to deepen the sadness of the book. Knowing how Hulda's career ends and how she felt about her life when she was sixty-four adds poignancy to how she spends the decade this story extends over. I'm now looking forward to the next book, "The Mist" which will be released in English next year. An insight on my need for books. When I saw this GoodReads tweet, I finally understood my strong need for books (despite my limited reading time and mountainous TBR pile). This year I've decided to tackle my TBR pile by reading thirty books from it that are the first in a series and assess my eagerness to read the rest of the series in terms of Yes / Probably / Maybe / No. Of the four books from my list that I read in March, three are for series that I really want to follow up on and one was a definite no. I also read a first in a series book that wasn't on my list and that also gave me a new series to follow. "A Curious Beginning" was a bit of a departure for me as I don't normally enjoy lighthearted historical fiction but I'm glad I made an exception for this book. It is a splendid late-Victorian romp introducing the indomitable Veronica Speedwell: adventuress, lepidopterist and reader of crime mysteries. "The Steerswoman" has been around for a long time but is new to me. I was taken by its ability to present a robust sword and sorcery adventure that acts as a vehicle for exploring how science works as a way of seeing the world and the choices that those who curate knowledge have on whom to share it with and why. "Leviathan Wakes" was the biggest wow of the month. It turned me into an instant "Expanse" fan. The nineteen hours of the audiobook sped by, keeping me completely engaged and leaving me truly hungry for more. "Bone Dust White" had the makings of an interesting crime series but I abandoned it at the 55% mark from lack of interest. "Minimum Wage Magic" was a huge smile of a book: clever and original plot, engaging main character and wonderfully narrated. It took me back to the Detroit Free Zone (DFZ) that I first read about in "Nice Dragons Come Last" but with fresh characters and challenges. This time it's a tale of magic users scratching a living at the margins of the DFZ, which I found much more engaging. In the first three months of the Reading Challenge, I've read fourteen of the thirty books I'd selected and another five that I picked up as I went along. In the process, I've found eleven new series that I'm keen to follow.